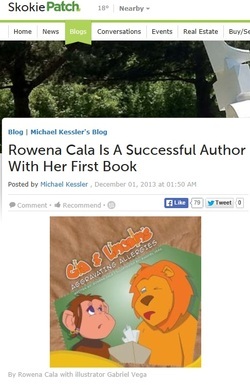 Watch Rowena discuss Gia and Lincoln's Aggravating Allergies at the FoxTale Book Shoppe's Emerging Author Event on August 2, 2013! “Would you mind if I touched your beautiful mane?" inquired Gia. "I've never been this close to a lion before." “All right,” agreed Lincoln. He was very proud of his flowing mane and liked when others admired it. Gia leaned closer to Lincoln and reached her hand toward his head...“Achoo!!!! Achoo!! !” sneezed Gia loudly. In the picture book, Gia And Lincoln’s Aggravating Allergies, Gia, a helpful monkey, springs into action when she finds a dejected lion, Lincoln, beneath her shady tree. She learns that he’s allergic to meat, but loves bananas! They become fast friends. But soon Gia discovers a new fact about herself –- she’s allergic to fluffy lions. They resolve to overcome this aggravating obstacle to their burgeoning friendship. Lincoln’s zany attempt to cheer up Gia results in a serendipitous twist, revealing a way this banana-loving duo can remain friends after all. Winsome dialogue and expressive illustrations underscore the excitement of meeting a kindred spirit, of gladly embracing imperfections, and of making adjustments to accommodate a special friend.